counting down the last few hours of july 2007... ang bilis ng araw!!! well this month has been a relaxing month for me. i spent the whole month as a full time housewife. i developed few hobbies during this time. as i've told you before, i'm hooked in digital scrapbooking. beacause of this, i met very artistic friends that are there to answer my never ending questions regarding scrapbooking. i still have tons of things to learn and mostly i need to do and practice many, many, many (emphasizing the word many) layouts to improve my skills. about us naman... eric and i are doing ok... all month long, i've been cooking everything that he'd ask for. i'm into the new teleserye of abs-cbn which are ysabella and natutulog ba ang diyos..i make sure i watch every single episode...(paano na pag nagwork ako ulit). eric's been bugging for for his new toy (will let you know what it is pag nabili ko na!!) and mostly, our relationship grew deeper this month, since i realized that i am really willing to give up everything for this family, even my career!!! well this is it for now...looking forward for the month of august..it will be a memorable one..since we will be celebrating our 5th year anniversary of being civilly wed. and i will starting my new job... hopefully many more blessings come our way!! my day was filled with household chores! i cleaned our kitchen and living room this morning. Grabe nakakapagod, even though our house remain neat since we rarely use our living room, kasi may tv naman kami sa room namin yet every other week i need to clean it. i could just imagine when there's kids in the house..siguro instead of every other week magiging every other day na ang paglilinis ko!!! how i wish we were in manila, para may katulong... here kasi sa states gawa mo talaga ang lahat!! 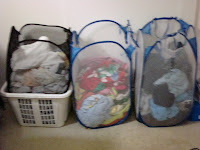 after cleaning the house, i loaded 3 loads of laundry (ang dami!! ), buti nalang dito pure washing machine and dryer ang gamit!! kaya ang talagang nakakatamad lang is the pagtitiklop ng clothes!! and normally i tiklop the clothes right when i get it out the dryer para hindi na kailangan na i-iron!!! then after all that we continued our search of a korean restaurant...so we headed back to wilshire area in LA to look for a place to eat!! and we were lucky this time..we found this small restaurant that serves authetic korean dishes...super sarap!! i'm so tired right!! i tried to do atleast one layout for our calendar..but my mojo is not here right now!! i'll just try again tomorrow!!! need to go now..good night!!! it started last night, i caught myself surfing the net all night and when i looked at the clock it's already 1:30am, so i closed the computer and went to bed. but around 2am, i was so hungry... so i stood up settled for some ice cream, because i was so noisy, eric woke up from his sleep. then he asked me "babe hungry ka? gusto ko ng burrito, bili tayo, nagugutom din ako!" so here we are almost 3am finding a burrito place that is open 24hours. then eric remember that there is a 24hr burrito place in azusa..so we drove there and ordered some midnight snacks (meal!!!) by the time we finished eating it was already 4am...galing ng food trip namin noh? and ofcourse sleeping that late means waking up late the following morning...so by the time we woke up..it was already past 1 in the afternoon. i was planning to load some laundry today but syempre umiral ang katamaran ko..
so lets see kung anong tripping namin tomorrow...i'll let you know!!! this sone is one of my mushy songs for eric. i'll admit it, everytime i hear this song, i can't help but to shed some tears (even writting about this is making me teary eye!!!) the lyrics is just so perfect for me. our relationship had been thru so many trials and not everyday is a happy day, but our love kept us together. !!! and to my husband, eric, i promise to be here by your side no matter what!!! i love you so much!!! credits: brown doodles by gina marie huff of weeds and wildflower designs; frames by "sommer kit" by sarah-design; paper by scrapbooking plus software. liKe my layout, i or we (eric and i) have so much dreams for ourself and for our family. sometimes we wish to win the lottery so just that we have all the money to buy our material dreams, but at the end of the day..my only dream is a simple life with my husband and someday with my children. the manager for postpartum floor in valley presbyterian hospital called me in today. she just want to see me again before i start work in 2 1/2 weeks. i met her before i went home for manila, and she wanted to update me with my employment status. yipee the best update..she told me that since may of 2007 they increased the rate for a new grad nurse...!!! yehey...additional money for me!!! i am somewhat excited in working again it's been 1 1/2 months now since the last time i worked plus add the one month that we were in manila. i like being a housewife. i like the fact that i have all time to serve my husband!!! tumataba na nga sya eh...kasi i cook him breakfast and dinner everyday!!! but on the other hand, i am really bored, my nursing instinct is calling me...i want to take care of my patients again...so here i am, enjoying the final few weeks of being a fulltime housewife!!! credits: papers by spring kit of shannon jackson; embellishments: sommer by sarah-design; alpha stitch: Pamela McNicols ; brown heart by kitgrazi by ValGouveia Designs. here's 2 additional layouts for our 2008 calendar. i am enjoying downloading kits online. i am still in the freebies but i am really tempted to buy scrapbooking kits online na, kasi the nicer ones have a price on them...syempre !!! well i like mix and matching the kits that i'm getting, kaya lang hirap na pag mag-susulat na ng credits, nakakalito!! so here it is..enjoy!!! in few weeks time i will be starting my new job...hay sarap maging housewife..as long as may naluto kana at malinis ang bahay..you can do whatever you want!!! but on the other hand..i miss having my salary every two weeks... and to tell you the truth i'm starting to get bored..kaya i am am excited na rin to start my new job!!! but any help to improve this is really appreciated!!! it's been exactly one hour since my last post..and during that time..i turned my blog to a cotton candy land!! i am not really into too much pink..but i dont know how to make the style different..
i dont know how to achieve this..but i will not stop here and i know that somehow i will get the perfect look for my blog!!! i want to make the look of my blog personalized...and for hours now..i've been changing the look of it and i'm still not contented with it's look..hay naku..sumasakit na ang ulo ko dito...!!! kaya naman if anyone reading this blog of mine right now and is willing to help me..let me know...will really appreciate it talaga...!!!! credits: papers from "spring kit" of shannon jackson; stitches with buttons by tracy sims; circle embelishment from "nocreedgirl2"
3 layout done, 10 more to go for our 2008 calendar!!! Credits for the embelishments of this layout: "Tangerine Truffle Kit" of "Diana of Scraps Up"
my mommy and i during my papa's birthday. i still have the flu virus this day and feeling really really bad, but i really forced myself to attend my papa's party. Journaling: Mommy, For all the things you have done for me, all I can say is Thank You. I would have not been where I am right now, if it's not for all your sacrifices. am me now because of you. You've molded me to the best that I can be. You were not only my mother but a friend who I know is always there for me. There are times when we argue and fight, but at the end you are still my mother and I am still your daughter. If there's one thing I wish and pray for you is that you let go of all the pain and replace it with happiness in your heart. May you always have good health and no matter what...my love for you mommy is everlasting!! this is my first scrapbooking kit that i downloaded form the internet..and my fault i did not write the credits for this page...promise the next time i do download i will note the designer fo the page. for the artist who created this kit..this is for you!!! my nieces and i at our house in makati. hay naku they are all so makulits...but even though, it's so much fun to be with them. nakakalimutan mo lahat ng problems mo..because they are so carefree!!! kaya naman i pray to God that when it's time for eric and i to have children, i wish that our children to be as smart, obedient, and pretty as my nieces. i played around with the color purple in this layout. and just by looking at this page, i'm craving for an ube flavored ice cream!! what i can say is...this phone is worth every penny!!! thanks joyce for tagging me..memorable 'to, first one eh!!! 1. i can't sleep without having my back scratched...sabi nga ng asawa ko para daw akong pusa..konting haplos sa likod super antok na agad ako..na i will fall asleep right away!! 3. super iyakin ko..ewan ko ba ang babaw ng luha ko.. basta no need to elaborate, umiiyak ako pag sad, galit, happy, and worried ako!!! 5. i am the most talentless person in this world...pero 'wag ka.. 'd ako marunong sumayaw pero member ako ng cheerleading team noong middle school ako and dancetroop noong highschool ako, tapos pag-dating sa kantahan, ay ibigay sa akin ang magic mic..kung hindi magkakamatayan tayo!!! 6. hindi ako umaalis hanggang hindi ko nakikita sarili ko sa picture..this started noong nagkaroon ako ng digital camera...i base kung ok yung make-up ko and attire ko sa pagkalabas ng pics..pag mukhang ugly ako sa pics...i need to redo my look!!! 8. love na love ko asawa ko..!!! hehehe..can't live without him...!!! hirap pala nito..well hindi ko alam kung kanino ko ito ipapasa...parang lahat ng nasa link ko na tagged na eh..so pass muna ako..promise next time..i will pass it on na!!! I saw this clip from sister jengkie's blog and i fell inlove with this little girl. Her name is Connie Talbot and she is only 6 years old. Hay...how i wish i can sing like her!!! i tried using circles in my layout...it's not the best...but hey, atleast i tried!!! i've been wanting to load our wedding onsite in youtube. since i've been having a hard time loading it using our computers...i asked my gandang joanne if i she can load it for me using her computer. so i went to her house yesterday....hay buhay...i bought the wrong CD, instead of the onsite, i grabbed our wedding pictures CD... so anong magagawa ko..tinatamad naman akong mag-drive pa uwi just to grabe the right CD... naku talaga yatang ayaw i-pa-load yung video namin sa youtube!!! so ang nangyari naging tagasauli lang kami ng aming mga asawa ng mga walang kuwentang bagay na binili nila sa Fry's. the gentleman in the stripes is eric's childhood friend anggo . they love to debate about some stupid details...at sa pagdating naman sa streetfighter...hindi parin namin alam kung sino talaga ang ultimate champion!!! what a date!! July 7, 2007... i heard from my weddings@work sisters that there are alot of couples planning to get married today..kasi nga naman added bonus na lucky 777 yung anniversary nila (then sabi noong isang sister ko..."naku napakadaling tandaan na nyang anniversary date namin..pag-nakalimutan pa naman ng mister ko yan ewan ko nalang!!!). it must be fun to have such a nice wedding anniversary. when we were planning our wedding we did not really have a significant date to chose from, we just got the one that is the most convenient for us and for our guests!!! so what can i say, i might not have a 777 anniversary date...yet i am as lucky as those couple getting married today...maybe even luckier!!! this are some of our pre-nuptial pictures taken last may 8, 2007. i also had my trial hair and make-up that day with ms. jesy alto. i liked my make-up here but eric hindi masyado...sabi nya mukha daw akong mannequin!!! (hehehe hindi lang sya siguro sanay na makita ako in full make-up!!!) but with our suggestion jesy lessen my make-up on our actual wedding day and my husband was happy!!! we were really planning a theme of "everyday life in manila" for our pre-nuptial pictures. sabi ni dino (our photographer) mag-pictorial kami sa may tricycle, jeepneys, fruit stands and so on.... super excited kami doon sa idea na yun kasi nga para ma-showcase namin sa mga friends namin abroad what manila looks like...kaya lang during the day of our pictorials it started raining!!! tapos medyo we ran out of time narin kaya we just decided to have it inside dino lara's studio!!! it was so much fun...we only did few of the formal poses mostly wacky ones..!!! this one naman i really liked the black and white effects..!! it's already July... half way done year 2007!!! so far this year has been very nice to me..hopefully it stays like that until the end... i'm enjoying not needing to work and being to give my 100% attention to my husband... in addition to my digital scrapbooking...i need to start downloading songs to my i-phone!!! it's pretty cool... i am still not tired playing with the features of my new phone!!! but my dilema now is we need a new computer..our desktop and laptop is still the outdated version of computers. since we are now starting to download music and with all my pictures and files in our computer...it's starting to slow down (anyways to start with it's already slow..!!!) so we are now shopping for the best computer for us and hopefully my first paycheck on my new job we can buy a new one!!! yippeee... that's it for now... here's my newest layout...i tried to stay away from any shade of blue!!! !